I began my musical journey at the age of 7 on the piano. While I had many other informal encounters with music at the time, I received my first formal tutelage for piano. At the age of 9, I played my first notes on the trumpet. After 2 years of music camps, regional bands, and trying to emulate the best trumpet I could put in my pysche, I was ready to take my prepubescent trumpet playing to the next level. Thus began my plunge into musical maturity and the pursuit of excellence. Competition, Music Festivals, and the Sublist. 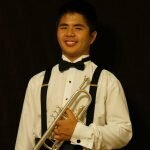 As a young musician pursuing opportunities for trumpet, solo/chamber competitions, summer music festivals, and large ensemble work were bound to be certain prospects. These experiences colour my musical background and continue to provide me with a vast library of invaluable and life changing moments. My time at Indiana University was when I really discovered much about myself; personally, musically, and professionally. As a student of John Rommel, I became well acquainted with the teachings of Bill Adam and Arnold Jacobs. While lessons with John were more Adam orientated, I found myself gravitating towards Jacobs-esque approach to brass playing. (Albeit, both pedagogies drive home the importance of goal orientated learning and the power of thought driven stimuli). At the end of my undergraduate career, I came to the realization of how I wanted to leave my mark in both the pedagogical and performing world. I am a practitioner of music. I am a broadcaster of expressive sound, and a vessel for information to be passed on. These are, in their simplest forms, the duties of a musician, that I will continue to fulfil with the utmost excellence and integrity.